order azithromycin over the counter From beer tastings to meet the brewers to fundraisers and more, we love to put on events that showcase craft beer & food, community and great people. We love to partner with local breweries & businesses to put on fun and interesting events throughout the year. Our biggest events of the year are our Anniversary Party & San Diego Beer Week, both of which feature an outdoor beer garden and hundreds of beer on draft. Stay tuned! « Pliny the Younger Tappings! 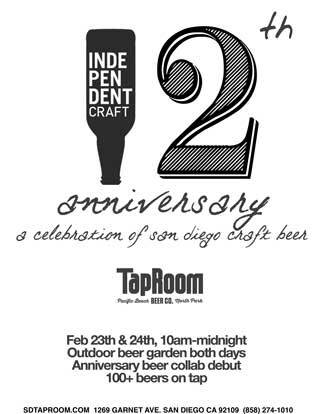 Our 12th Anniversary Party and San Diego Beer Celebration will take place on Saturday & Sunday 2/23-2/24 in our back parking lot. This year will be a celebration of San Diego Craft beer and everything it represents. We will be bringing the breweries, the brewers, the supporters and the of course the beers together this weekend to celebrate our amazing craft beer community. Join us for a killer time of awesome local beer, food, and amazing people. As always we’ll be tapping over 100 beers including Pliny the Younger and other rarities you won’t want to miss! Raffles, games, prizes and too much fun will be had by all that attend, come one come all! (no tickets needed, all ages welcome).